Fort Lane was a supply depot built during the Second Seminole War near present-day Geneva, Florida. 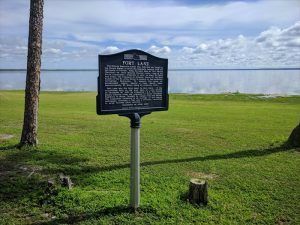 During the war, General Thomas S. Jesup sent General Abraham Eustis on an expedition south from Fort Mellon to the headwaters of the St. Johns River to capture retreating Seminole Indians. Traveling with Eustis was a large force of over 2000 troops, 1000 horses and 70 wagons, who were tasked with establishing a line of support posts. Fort Lane was the first of these posts to be built, located about 15 miles away from Fort Mellon. Next was Fort Christmas about 20 miles from Fort Lane. The fort was established on the west bank of Lake Harney on December 18, 1837, by two companies Companies of the 2nd United States Infantry under the command of Major Greenleaf Dearborn. The companies consisted of an average of 125 Florida militiamen, including a fifer and a drummer. It was named for Captain John F. Lane of the 2nd U.S. Dragoons who died in Florida in 1836. The fort was abandoned in March 1838. There are no remains today but a historic marker designates the site in Fort Lane Park at the waterfront on Fort Lane Road near Whitcomb Drive, east of Geneva.